Because of how much tension is involved with this automatic mechanism, it's no wonder your garage door system can malfunction due to a variety of reasons. From hardware parts that become damaged to electrical components that begin to glitch, the sheer number of potential issues can be staggering, and figuring out exactly what's wrong is sometimes very difficult. Our technicians specialize in garage door troubleshooting, and we'll be happy to help you with any type of issue you may experience. We mentioned electrical glitches earlier, and this is the unit that can suffer from them. Your garage door opener relies on both mechanical and electrical components to function, and when even something small like a wire or a chip on the circuit board gets fried or detaches, the entire unit can essentially shut down. Of course, there are also mechanical malfunctions that can occur, like worn out motor gears and a broken chain or a torn belt (depending on the drive system the unit uses). Whatever the case may be, our experts will troubleshoot the opener until they locate the problem, and then apply the most effective solution for it, in order to ensure that you can keep using your door remotely without any issues. 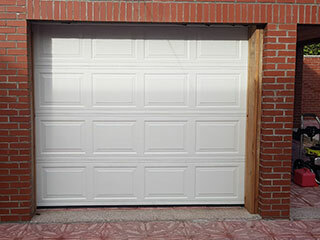 It's really no wonder one of the most common problems that garage doors can experience is a broken spring. These units are under constant stress, and their structural integrity is therefore bound to fail after a while, even with regular maintenance (although that can extend their longevity significantly). If you discover the spring broke, you'll need to get a professional to replace it for you safely. Whether you're dealing with a bent track that caused some rollers to pop out, or a damaged panel that's ruining the curb appeal of your door, our technicians will be able to help. At Garage Door Repair Studio City, we aim to be the go-to team that every local homeowner can rely on. If you need emergency repairs or any other type of service, don't hesitate to contact us.